Working for Health is a Community Interest Company (CIC). This means that any profit we make is re-engineered into the service. We do not have any shareholders. This means that our entire focus is on supporting people to change their lives and make that journey back to employment. We pride ourselves on our foundations, our philosophy and our ethical way of carrying out our business. 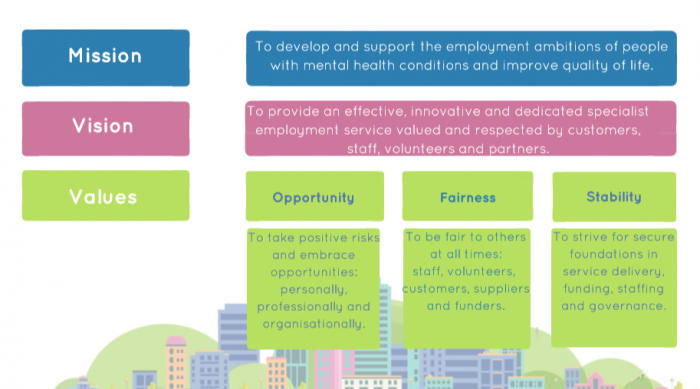 To develop and support the employment ambitions of people with mental health conditions and improve quality of life. To provide an effective, innovative and dedicated specialist employment service valued and respected by customers, staff, volunteers and partners. Opportunity – To take positive risks and embrace opportunities: personally, professionally and organisationally. Fairness – To be fair to others at all times: staff, volunteers, customers, suppliers and funders. Stability – To strive for secure foundations in service delivery, funding, staffing and governance.